Special Containment Procedures: No containment procedures are necessary for SCP-4274 or SCP-4274-2. Scientific research into SCP-4274-1 is to be monitored and disrupted as necessary to prevent discovery of SCP-4274-1's anomalous properties. However, SCP-4274-1's existence and non-anomalous properties are permitted to remain public knowledge. If any specimens with preserved neural tissue are discovered, they are to be obtained by the Foundation and contained in Low-Value Item Storage. Description: SCP-4274 is the designation given to a series of radio broadcasts issued between 1848 and 18781. The only known records of these broadcasts are the diaries of Elizabeth Carlyle, a Catholic nun with the anomalous ability to receive and understand radio transmissions. She has been given the provisional designation of POI-73367 and her anomalous abilities are being considered for separate SCP classification pending review of similarities to SCP-1723. The diaries were brought to the Foundation’s attention following the publication of an edited collection of entries by the Providence Spirituality Center in 1973. An investigation into the diaries’ claims of contact with a supernatural entity revealed that the diaries contained information anachronistic with their time period, notably, several exceptionally detailed and accurate accounts of the Earth's magnetosphere. This prompted an autopsy of the author's remains which revealed the anomalous physiology of her skeletal structure2. All printed copies of the diaries have been destroyed, and the originals have been obtained by the Foundation. Selected relevant entries are available in the Addendum below. SCP-4274-1 is the species Ectopistes migratorius3. In 2004, research by a non-Foundation body on several unusually well preserved specimens revealed a biological structure capable of generating minor magnetic fields and electromagnetic waves, including radio waves. 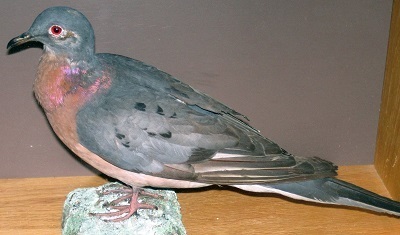 It is now theorised that similar to Columba livia domesticas4 ability to detect magnetic fields, SCP-4274-1's capacity to generate electromagnetic waves was used to assist flocks in navigation and co-ordination. From this and evidence from SCP-4274 it is theorized that sufficiently large flocks gathering resulted in the creation of SCP-4274-2, a gestalt intelligence capable of perceiving and transmitting a variety of electromagnetic waves. The means by which SCP-4274-2 came into existence are anomalous and are not explicable by standard models of physics. Much about how SCP-4274-2 functioned remains unknown, however it is not considered to have posed any significant threat. Its transmissions indicate that it was greatly limited in its capacity to both perceive and interact with the outside world. This includes members of SCP-4274-1, which were not directly controlled by SCP-4274-2, but rather functioned as a substrate on which it's consciousness existed, analogous to neurons in a human brain. In fact, SCP-4274-2 appears to not have been aware of their existence, and had a similarly limited understanding of most of the material world. SCP-4274-2 has been categorized as a Class II sapient entity, with intelligence approximately equivalent to the typical human. The entity is to be considered Neutralized as of 1878, which was when the last large flocks of Ectopistes migratorius were killed prior to their extinction in 1914. Addendum: Selected Diary Excerpts The diaries of POI-73367 are extensive, beginning in 1844 and continuing until her death in 1901. Many entries make reference to SCP-4274, and several entries of particular interest are collected here. Father always told me that a habit of writing was the best way to keep one's thoughts in order, and I pray that is the case now. Ever since I arrived in America, I have been plagued with the strangest delusions. I hear a voice, a voice that no other can hear, that sings to me in a language that is without words, and yet filled with meaning. I fear that I am going mad, that the illness that has left me an orphan in this foreign land is claiming my sanity too. Or worse, that the Sisters are right and the voice belongs to a demon trying to steal away my soul into the darkness. Despite what they tell me, I cannot believe that this is true. No delusion could sound so real. No demon could ever sing a song of such beauty, so filled with joy at the world. When I am feeling more optimistic, I fancy that it is an angel, sent by Mother and Father to watch over me. If so, they needn't worry. The work in the convent is hard but I have a bed, a full belly and a love of God to carry me through. I can survive without the need of a guardian angel. Still, despite its beauty, the creature does sound so lonely. Perhaps we could help keep each other company? This entry contains the earliest reference to the SCP-4274 transmissions. It was written approximately eight weeks after POI-73367's arrival in the USA5, and six weeks after she was taken in as an initiate of the Sisters of Providence. I'm writing this sitting on a damp stump in the woods. It's the third time this week I've snuck out, not to go anywhere in particular but just to have some time to myself. It's so suffocating there, I'm always surrounded by people and yet there's no-one I can really talk to. No-one who understands me. That's why I love going out like this, at the time when all others are asleep and the world becomes a more magical place. Back home they called this the witching hour. That's not a phrase the nuns would approve of but that doesn't matter. The witching hour is just for me. I wanted to try and understand the voice that I hear. It's clearer at night, not louder exactly, but easier to understand in a way that I cannot fully explain. I hear his thoughts and emotions and despite their foreign nature they make a strange kind of sense. I am certain now that the voice belongs to an angel, he is too filled with joy and love for God's Creation to be anything else. And yet he won't respond when I talk to him. I thought he might be ignoring me, that his search was only for angels and other such heavenly beings, but now I think that he simply cannot hear me. It makes me so sad to think of someone with such joy to be so alone. The Sisters teach that the only angels not in Heaven are those who have fallen but I cannot believe he could be of evil nature. Perhaps he has been sent here as a test from the Almighty? If so I wish him all success and even if he does not know it, I will keep him company on these quiet nights. This entry contains the first mention that SCP-4274-2 was attempting to make contact with other entities. No other SCP-4274-2 instances are known to the Foundation and this instance's formation is considered to have been an isolated event. I have a headache today. I am prone to such afflictions, and while this is certainly not my first experience it is by far the worst. There is the most awful screeching in my head, like the rumbling boom of thunder mixed with the keening of a mother goat in labour. Only now, the sound is directly in each of my poor ears. I have no desire to shirk my duties, but I simply cannot face tending the sick6 when I count myself amongst their ranks. The Sisters whisper behind my back, calling me weak and delicate for succumbing to such pain, and Mother Mary loves having another excuse to scold me. She says my faith should give me the strength to overcome such petty maladies. I would like to see her work with such a racket in her head, she who has not worked a nurse's shift proper in twenty years. At least my lonely angel understands. His voice is hard to hear through the din but I can tell he is hurting too. Cheer up old friend, we'll suffer through this together. The pain experienced by both entities is likely linked to electromagnetic interference caused by the concurrent Solar Storm of 18597. Another battle, another parade of broken and bloodied men. We are a nation tearing itself asunder because men cannot see the humanity of their fellows even as they live amongst them. At times such as these it is hard to believe in a loving God who cares for his children. And yet sometimes, the beauty of his Creation still shines through. I had finished a long night in the wretched tents we call a ward and was trudging back through the mud of the camp to the women's sleeping quarters. Then, the harsh light of the sun dimmed above me, and the soldiers called out in alarm. But I had no fear. I have some education to my name, and know an eclipse is not a danger, but simply another of God's miracles. A little piece of beautiful night granted in the midst of the day. I found a patch of clean grass to sit on and kept mine eyes shielded from the sun, for it still burned too bright to stare. I enjoyed the coolness of the dark settling over the land, the stars coming out while the sun hid. A beautiful sight, that, sadly, my fellows could not appreciate. Once they saw there was no danger, they moved on, sparing only grumbles about curses and ill omens. But I heard another voice, louder than the grumblers, my lonely angel rejoicing in the same miracle that I did. His eyes must be better than mine though, for while I was content to simply watch for stars he sang of patterns in the earth and in the sky. It cannot be described in words, his vision is too different from mine, and he can see the whole of Creation in ways I do not understand. His voice is directed at the heavens now, calling out to the planetary bodies above. He is telling them of our world, describing it in numbers and in poetry. I have sketched here a poor copy of what he has described, a map of our world in the cartography of the heavens. I do not claim to understand it and my copy is certainly flawed, but when he sings of it his voice is filled with such joy. He may think himself alone on this world of ours but he can still see it's beauty. And so long as he can find the strength to continue, so can I. Following this diary entry were several highly accurate sketches of the Earth's magnetosphere and one fairly accurate sketch of the Venusian magnetosphere with some minor errors. All diagrams were detailed to a point beyond the understanding and capacity of contemporary science. It has been a long time since I last heard my angel speak. At first I had blamed myself for the silence, thinking that my increased responsibilities had kept me too distracted to hear my angel clearly. I confess also that I have had less need of my angel as of late. There have been times when I have felt so alone in this world, and his voice was all that kept me going through the darkness. But now that I am a Reverend Mother I have my initiates. They are each talented and wonderful young women and mentoring them has filled my days and given me a sense of fulfillment that I didn't know I lacked. With such distractions, I felt the absence of his voice was justified and that there nothing truely amiss. I was wrong. Terribly wrong. My angel sang today in a voice louder than I've heard in years, a song of his death. His silence has not solely been the result of my inattention but also his deterioration. I do not know how an angel can die but he tells me his sickness is fatal and I have no choice but to believe him. I can only hope that his death will mean the end of his exile, that he will be taken up into the heavens to join our Father and his choirs of angels. If so, perhaps we two could meet at last in the afterlife and I could tell him of all I had heard and all that it meant to me. For now, all I can do is what I have always done, listen and remember. I have recorded his last message below as best as I can translate it into the English language, although my efforts remain but a poor copy of his true song. This entry was the last intelligible SCP-4274 transmission. Several incoherent fragments were recorded over the following year with a gradual decrease in both volume and content. The last of these occurred in March 1878, corresponding with the hunting to extermination of the last large Ectopistes migratorius flock in Petoskey, Michigan in which an estimated seven million SCP-4274-1 instances were killed. There is no evidence of the survival of the SCP-4274-2 entity past this point. 1. Notably, this is prior to the earliest known human use of radio transmitters in 1894. 2. For full details see POI-73367 Autopsy Report. 5. Census records indicate she was born in Dumfries, UK on the 12th August 1832. 6. This refers to her work as a nurse at the Sisters of Providence run 'Our Lady's Hospital' which had begun in 1852. 7. This was one of the largest geomagnetic storms on record and was induced by a solar coronal mass ejection (CME) impacting against the Earth's magnetosphere. Similar events occurring more recently have resulted in widespread radio disruption.